Here you find useful information through our termly newsletters and view our children’s fantastic work. 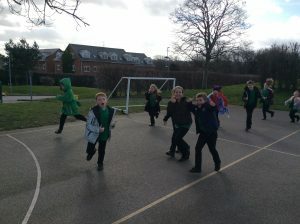 Check out Year 3/4 enjoying our daily mile (albeit somewhat blustery today!). 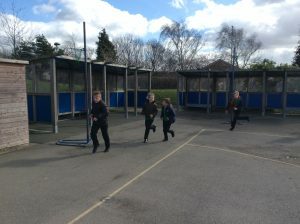 It was great to hear many children commenting today on how they had beaten their previous personal record. This activity is really boosting our fitness – particularly important for those Year 4’s going to Buckden who need some extra stamina for our long walk. Well done to those of you really pushing yourselves. Keep getting active whenever you can. During our International Studies fortnight we explored our given country and created fabulous videos to show case our learning. We then all cooked and completed exciting DT/Art activities. Our ‘No Pens Day’ was a great success. 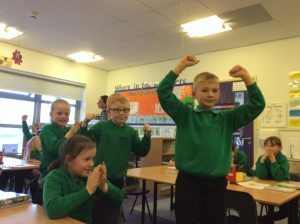 In our guided reading, we acted out the event from our text about Chinese New Year. 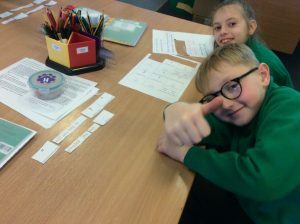 During literacy, we cut up sentences including speech and added the required punctuation. 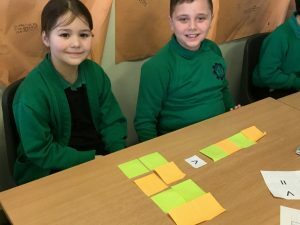 During maths in Year 4 we looked at placing the correct symbols into area questions. 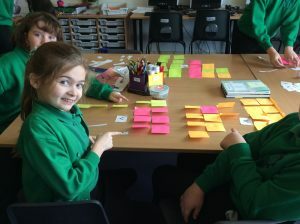 In Year 3 maths we worked in groups to practically solve problems and verbally explained our reasoning. Wendy came into teach us about how to stay safe on the roads, especially when travelling in a car, she taught us all about the importance of sitting correctly in a car and always wearing a seat belt. We performed a test to show what might happen to us if an accident happened whilst not wearing our seat belts and then when we had our seat belts on, We found out that we could be seriously injured are killed if we did not wear a seat belt correctly. 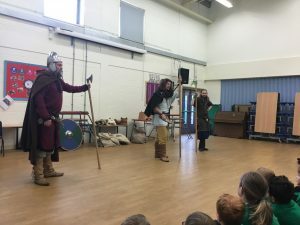 Vikings visited Years 3 and 4 this week as a hook for our new topic ‘Vicious Vikings or Clever Traders’. We found out lots of things including: where Vikings came from, where they traveled to, why they liked to invade countries and what life as a Viking was like. We listened to a traditional Viking Saga with some children acting out and making sound effects. They also brought in actual weapons that we could hold such as knives, spears and axes. Finally, we recreated a battle scene using shields and beanbags. The children loved the experience and are excited to learn even more over the coming weeks. We would like to thank the PTA for funding such an amazing experience for the children. We had great fun making bread with the bakers from Warburtons today! We tasted some different types of bread, then kneaded some dough to make our own bread rolls. Our classroom smells delicious and we can’t wait for the taste test of our own bread. Yummy! Our fantastic classroom displays showing just some of the work so far. A great start to the new school year! Year 3/4 made carrot cars as part of their PHSE lesson. We all had an amazing time at Buckden this year. The children were a brilliant team which made the whole visit great fun, even when we had work or walking to do! We had lots of positive comments from the Buckden staff and local residents about our children’s behaviour and manners – well done parents! Many thanks to all the adults who came with us – it wouldn’t be possible without them volunteering. We hope you enjoy this selection of photos from our visit – lots of smiles… and a few sheep! We can’t wait for the Y4 residential (19th to 21st April). Many thanks if you came to the meeting on Monday 13th March, but those of you who couldn’t attend should receive a print-out of the slide show. Just call in if you have any extra questions! Thanks for all the completed forms – please return any remaining forms quickly – reminders will be in planners. Here’s another copy of the kit list too, but remember to also bring your bears and other fluffy creatures for extra bedtime cuddles – bears are always welcome at Buckden! Year 3/4 made some delicious pizzas. Children also designed these fantastic pizza boxes. Namaste! We have had an amazing time in India during the last two weeks. We’ve cooked curry, done map work, written weather forecast scripts and tourist guides, drawn mehndi patterns, learned about the religions, flag, languages, Bollywood dance moves… I’m sure you’ve heard all about our fun learning already! After our world tour today we are exhausted, but we’ve loved the experience. Where will we travel next time? Sigwulf, Arnleif and Frothar came to visit and help us learn about their lives as Vikings. We had an amazing day with lots of us dressing up in Viking costumes. We learned about language, clothing, travel/trade & artefacts, weapons & warfare and even acted out a Norse saga. Brilliant! We have been improving our community garden area at the front of school. We have learned how to do the weeding, dig the soil in the flower beds and plant new seeds. Even when it rained we remembered our community spirit and went to help the Reception class children with their learning! Designing and making desk tidies using up-cycling skills! This has already got us thinking about Y3 and 4’s class topic for next half term: Reduce, Reuse, Recycle! We used air movement (pneumatics) to create moving parts in our Design Technology models. We designed and made our own scrumptious pizzas to take home in our fabulous pizza boxes. We can’t wait to cook and taste them!